Continuing the tradition of opposition outposts made in important structures around the world, Hope County is full of Cult Outposts, which house large amounts of cultists. Cultists use these outposts are forward operating bases and spreading their propaganda. This Far Cry 5 Cult Outposts Guide aims to provide you all the information about these Far Cry 5 Cult Outposts, how you can liberate them from cultist control, and make them your own. Each outpost is important for them as they allow them to keep control over different areas in Hope County. Losing an outpost means losing control and that is one of your goals in Far Cry 5. After main missions, the best method to reduce the cultist control in Hope County is by taking over these Far Cry 5 Cult Outposts. The outposts get bigger and harder to take over as you progress in the game. Each outpost you liberate gives you a good amount of reward including money and resistance points. Some of them also reward you with bonus vehicles and equipment. There are numerous ways of liberating an outpost so the game gives you total freedom on how you want to take over an outpost. 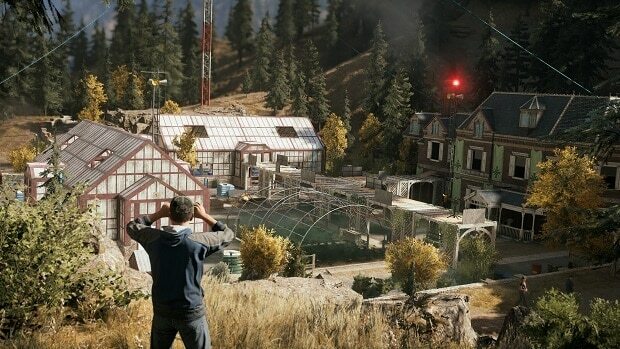 Inside these outposts, you will also find locked animals or resistance members as well as random citizens. Freeing resistance members makes them join you in the fight while freeing the citizens reward you. If you see, an animal locked up inside a cult outpost, open the cage and see how the animal wreaks havoc in the outpost making it easier for you to take over it. Once an outpost has been liberated, it will provide you with a fast travel point, ammo purchase and resupply point and makes the outpost a resistance forward base allowing them to grow stronger and eliminate the cultist control in that region. New side missions are also unlocked for that specific region once the outpost has been liberated. Below we have detailed all Cult Outposts in Far Cry 5 that you will have to liberate. We have also explained the best ways of tackling each outpost and aiming for the highest reward for liberating it. First up in our Far Cry 5 Cult Outposts Guide is the Ranger Station. Based in Dutch’s region, this is the most simple and easy outpost to liberate. It has no alarms and there are only four enemies here to take care of. You can find the Dutch’s Island region’s map in this outpost. It will reward you with money and 400 Resistance Points while eliminating the cult control from this region completely. Make sure to tag all enemies before you start the attack. You can enter from the main entrance and mow all enemies down but if you want to earn the highest score, we suggest you that you opt for stealth. Use your compound bow and take out one by one starting with the one nearest to the outbuilding. Moving on in our Far Cry 5 Cult Outposts Guide we have the Gardenview Packing Facility. Located in John’s region, this facility is an important outpost to cultists because this serves as the packing location of the orchard’s fruit which is supplied to their bunkers. This is yet another outpost. It has 1 alarm located at the unloading dock. This can be deactivated by either shooting it from the entrance or sneaking in the base from the south. There are six cultist enemies and 1 animal here. If you want to use stealth here, start from the water tower and tag all the enemies around the outpost. Once you know the location of all enemies, use the zip-line, enter the silo and get to its top. Use the zip line and reach the warehouse. Once there, you can start taking out enemies one by one starting with the guard on the rooftop. Use your bow if you want to use stealth otherwise just barge in from the main gate, reach the unloading bay and shoot the alarm. Once the alarm is down, mow down all remaining enemies and claim the outpost for yourself. You can also free the animal to add to the chaos. Once liberated, you will be rewarded with money and cult control will be lowered in the area. You will also find Gardenview Key in this outpost giving you access to the warehouse office. Moving on with our Far Cry 5 Cult Outposts Guide we have the U.S. Auto. Located in John’s region, the U.S. Auto cult outpost ensures that all vehicles and convoys of the cultists are in running condition. It has two alarms and eight enemies including a sniper. Sniper will make your life hell so taking it out should be your priority. Since both alarms are located in opposite sides, you will have to be quick about them. For the first alarm, from the main road, get on the rocks on the right side and approach the base until you can see the alarm control box, shoot it to deactivate it. You can also tag all enemies from this location. Now take the outside path all the way around the outpost making sure that nobody sees you, climb the bus and shoot the second alarm. Once the alarms are down, aim for the sniper and take it out. The sniper is located on the rooftop so you will need to be careful. Make sure that no one else sees you and climb to the top to strangle it. Once the sniper is down, start eliminating enemies one by one until all are down. In other case, if you want to use force instead of stealth, enter the area, eliminate the three enemies near the first alarm, and then deactivate the alarm. Run back; shoot the two enemies and then the alarm. Once down, shoot the sniper and the enemies inside the building to take over the outpost. Once liberated it will lower the cult control in the region. You will also find a region map inside the outpost. Next in our Far Cry 5 Cult Outposts Guide we have the Green-Busch Fertilizer Company. Located in John’s Region, the Green-Busch Fertilizer Company serves as another cultist outpost. There are eight enemies here including a sniper. It has two alarms as well which are located at eight end of the building. The sniper is located in the tower in the middle of the two structures. There are many grappling hook points in the outpost, which you can use for advantage. Near the billboard, if you climb the hill you can easily spot all the enemies and mark them from this location. This point also lets you view both alarm panels so you can take them out from a safe distance from here. The billboard also serves as a nice vantage point but it does not let you see both alarm panels. To take the sniper out silently, you can enter the building from the main road, use the ladder near the low building with the helicopter on it and climb the ladder next to the silos. Take out the sniper and the rest will be easy. Take enemies down one by one and you should be fine if you want to use stealth here. Once liberated, the outpost will reward you with the Ultimate Survivor – Enhanced craftable item and will lower the cult control in the region. You will also find a region map inside this outpost. Located in John’s region, Sunrise Farm is yet another outpost responsible for packing fruits and vegetables and delivering them to the front line bunkers. This outpost has medium difficulty as it comes with 2 alarms and 8 enemies. This time there are six normal shooters, one sniper and one flamethrower thrown in the mix. One of the enemies arrives at a later part when he drives a truck to the farm and parks near one of the alarms. There are also some hostages inside the small barn that you can save. Make sure you are not detected unless you can kill all enemies inside the small barn or else the hostages will be killed. There is also a mortar near the west side of the map, which you can use to even the odds against the flamethrower. Your main targets here are the sniper and the flamethrower. You can climb the pumpkin field water tower for a good vantage point to mark enemies and take them out as well using sniper rifles. You can strangle the flamethrower enemy but doing this will require that you clear other enemies around him first to stealth is your best option here. If you want to go stealth, you do not even need to deactivate the alarms and if you want to go head on with the cultists, you should deactivate both the alarms and then use the mortar on the truck to start some chaos. Seed Ranch is the toughest outpost in John’s region. This outpost is basically John Seed’s personal residence complete with an airfield. Expect heavy resistance here. This outpost has 12 enemies out of which three are snipers. Rest 9 are normal cult enemies. It also has three alarms and if one of the alarms go off, you will have to deal with a helicopter. Your best approach for this outpost is from the rear of the residence. Avoid entering from the main road or the airfield. Access the southern gardens, as they are your best option for this encounter. If one of the alarms go off and you need to deal with a helicopter, there is an RPG in the main lodge. You will have to be very vigilante about the three alarms. Spot them and you will see that they are in plain sight but getting to them will not be easy, as the area will be swarming with enemies. The best place to tag all the enemies is by climbing to the top of the north comms tower near the airfield. If you plan to use stealth, the north comms tower is your best approach as one of the zip lines here land right next to bushes near one of the alarms. You can hide the bodies in bushes here as well. Be careful of the machine gun enemies in the center deck that you need to be careful about. One of the snipers is located in the west tower, another one located in the hangar’s exterior deck while the last one is located in the hangar. Once liberated, the cult control in the region will be lowered and you will be rewarded with the Hunting Magazine. Another outpost in John’s region, the Kellet Cattle Co. is providing Eden’s gate with fresh meat. This outpost is not heavy apart from the presence of a heavy in it. There are a total of eight enemies here out of which there are 1 heavy, 1 VIP and 1 animal. There are also two alarms that you need to be careful about. Your best bet here is to strangle the heavy unit rather than going head to head with him. The roof of the cow barn is a good place to scout for and marking the enemies. It is also a good vantage point for sniping. If the alarms go off, keep an eye on the west road, as more enemies will arrive from there. If you want to use stealth then you will want to start at the water tower. Mark all enemies and start following the heavy once he starts patrolling. Keep following until it reaches the north side of the main house and then strangle it. Use the trailer and the barn for cover to eliminate the remaining enemies and take over the outpost. Completing the takeover will reward you a special vehicle ‘The Reaper’ and will decrease the cult control in the region. Moving on with our Far Cry 5 Cult Outposts Guide. This is yet another important outpost because the cut is using the rail yard to strip old trains and use the metal to fortify their bunkers. It features 8 enemies out of which 1 is a sniper and 1 is an animal. It has two alarms for you to deactivate. Both the alarms are located near each other in the open area. There are also two MG nests here. In this outpost, most of the enemies are located behind rail carriages so marking them is no easy task. One of the alarms is nearly impossible to deactivate without clearing all enemies around it first so taking them down beforehand is not an option here. Billboard and the water tower provide good vantage points for sniping and marking as many enemies as possible. If you are running out of cover while being on the ground, the blue upturned rail car provides excellent cover. For stealth approach, start by eliminating the enemies at the main warehouse. Afterward get to the roof and shoot the remaining enemies one by one. This will make it much easier. After all, enemies have been defeated, the cult outpost will be yours. It will reward you with the special vehicle ‘2012 Kimberlite TC6 M-Duty “Outlaw”’ and the resistance will be further lowered in the region. You also get the region map inside the building. This is the next one in our Far Cry 5 Cult Outposts Guide. Located in Jacob’s region, Pin-KO Radar Station is an important outpost. It has a radar station, which is being used by Eden’s gate to monitor the forest and clear the airways of enemy presence. It is vital that this outpost is taken over quickly. It has twelve enemies including two snipers, one heavy and two animals. There are two alarms for you to deactivate. One of the animals is also running loose in the radar station making stealth a very difficult option here. If you manage to reach the security hut right up to the main road, you will find some heavy weapons inside including an RPG. You will have to pick the lock to get inside. If you want the key, it is located on the upper level of the main tower. You will need access to this building if you are fighting enemy helicopters. The heavy weapons will help you take down all enemy helicopters easily. The heavy and the free animal will make the mission very hard for you if you plan on running stealth so we recommend that you keep them as your last targets. Start by clearing out the main tower because it will give you an excellent vantage point to secure the outpost. It will also give you a lookout point for the outpost. Make sure to hide all bodies if you are going stealth otherwise the enemies will be alerted and the alarms will call in helicopters making it more difficult for you. Once the outpost is secured, you will unlock the Kaumbat H-158 Sky Scarab and 400 resistance points. You will also find the region map inside the outpost. Furthermore, in our Far Cry 5 Cult Outposts Guide we have the Whitetail Park Ranger Station. Located in Jacob’s region, the Whitetail Park Ranger Station serves as an Eden Gate’s training grounds for new recruits as well as keeping supplies for the soldiers. It has 8 enemies including one sniper, one heavy and one animal. There are two alarms for you to tackle as well. There is a mortar nest here as well so if the reinforcements are called, they will use it against you so make sure that you eliminate them quickly. This is not a difficult outpost if you come from the upper ground on the west side. Avoid the east road or the north side. Use the west side for making this outpost much easier. Start with taking out the sniper and using the building rooftops to your advantage. If you want to open the armory, find the key to the north building with the alarm. The drainage tunnels and the motor pool warehouse also provide great place to hide. The drainage tunnels also provide an easy way to reach one of the alarms. The locked animal is also good for creating chaos in the outpost. If you plan to use stealth, approach from the billboard, taking out the sniper and then sticking to the motor pool roof. Keep the wolf as the last target as it cannot sound the alarm once left on its own. Once the outpost is clear, you will earn 400 resistance points. You will also get the region map, a Cheeseburger Bobblehead and a Perk Magazine inside the outpost. This is the second to last entry in our Far Cry 5 Cult Outposts Guide. The F.A.N.G. Center is the outpost where the cultists are keeping the captured wolves and storing them before sending them to Elk Jaw Lodge. This is a relatively difficult outpost as there are 11 enemies including 1 sniper, 2 Cult VIPs, 1 Heavy and 2 Animals. The outpost also has two alarms and three MG nests. F.A.N.G. Center is a tightly packed area where stealth could prove to be a little difficult. Your main targets here are the VIPs and their wolves, which will make this mission very difficult if you want to complete it in stealth. Avoid the main road and the dirt road located at the south at all costs. Do not hide in the drainage tunnel as well because the space is very small and you will have no visibility of the upper level of it. Your best bet is to approach the area from the green shed and the structure next to it. This will provide you with a decent area to look around, hide and mark the enemies. For using stealth, marking enemies is very important so we recommend that you use the rock where the cheeseburger sign is attached. This place will also give you the opportunity to kill the sniper as well as one of the VIPs and his wolf. Use the zip line, get inside the structure and start eliminating enemies starting with the one located next to the machine gun nest overlooking the dirt road. Now aim for the VIP in the middle and his wolf and then go after the heavy. Once the heavy is down, take down the remaining enemies and the outpost will be yours. It will give you 400 resistance points and the essentials outfit. You can also find the region map and a Cougar Baseball Card in the outpost. This is the last entry in our Far Cry 5 Cult Outposts Guide. Located in Jacob’s region, the Elk Jaw Lodge is the place where the Eden’s Gate is experimenting on the wolves and turning them in ‘Judges’. However, the outpost is fairly easy to take over. It has two alarms and 10 enemies including a sniper, a flamethrower, 2 VIPs and two animals. Your first targets for this outpost should be the VIPs, the sniper, and the flamethrower unit. There are also two MG nests and a mortar nest here. You can use the mortar nest if the battle goes sour. The woods from the northeast give you an excellent approach point. You can open the wolf pens and then go for the first VIP. Head inside the lodge using the grapple point and you jump down to kill the second VIP. Once they are down, eliminate the remaining enemies and the outpost will be yours. The docks also provide an excellent attack point even if you plan to come in using stealth. Once the outpost is clear, you will get 400 resistance points. Inside the outpost, you can find the region map and a magazine. This Far Cry 5 Cult Outposts Guide is a WIP. We are adding more outposts to this guide so check back soon for information about the remaining outposts and how you can take over them easily. This outpost is located in Faith’s region and serves as the launch spot for Eden Garden’s water convoys and carrying supplies over the water. This is a medium level outpost with two alarms and ten enemies including a sniper, a heavy unit and three enemies patrolling the area on a watercraft. There is also an MG nest and a mortar nest. This can be done easily if you manage to take care of the enemies on the watercraft. If you are looking for an interior to start your attack, the warehouse located on the north is your only option however; there is a sniper on the top that can easily see you spoiling a stealth attempt in the process. You can also use the rocks on the south side or the docks to the west side to initiate the attack. The docks present the constant threat of enemy boats coming in and out so you will need to be quick and stealthy. The fence on the north side also has a gap, which you can use to enter the outpost. If you are detected and an alarm is raised, the mortar will start pounding you so avoid getting the alarms raised or eliminate the mortar team quickly. If you want some ammo on the go, head to the shed near the junk and you will find some ammo inside the shed. You will have to break the boarded window to get inside. For stealth, stick to the rooftops and make sniper your primary target. The rocks on the south will give you a good vantage point to mark all enemies. As for the enemies on the boat, eliminate one using a silenced gun and they will disembark the boat to search for you on the ground. Once they are out of the water looking around, take them down as you see fit. Once all enemies are eliminated, the outpost will be yours. Once the encounter is complete, you will get money and 400 resistance points as a reward. You will also find a region map inside the outpost. Located in Faith’s region, the Eden’s Convent is a cultist devotee site where the devoted rest while walking towards the Path to Eden’s Gate on their pilgrimages. This is a small and easy outpost to take over. It has eight enemies including one VIP, one Angel and one Animal. It has only one alarm and one MG nest as well. This outpost has entrance and access points all around it thus opening up a wide range of options to choose when trying to attack it. The hills on the west provide an excellent marking spot as well as the rocks located on the southeast and southwest of the outpost. Pick any of these locations to mark enemies. Near the alarm, one of the cultist patrols the area so you need to be well aware of his location. The Angels are located inside the church, save them for last. If you start from the hills located on the west, you can complete the stealth route without the need of any ranged weapons. The enemies are all in your path one by one and you can eliminate them by using melee from behind. Once the outpost is free, you will be rewarded with money and 400 resistance points. There is also a magazine inside the outpost for you to collect. Another outpost located in the Faith’s region, the Sacred Skies Youth Camp is the site for Bliss drug cultivation. The cultists plant special flowers here that later become the Bliss drug. This is yet another easy outpost with nine enemies out of which one is a sniper while two are Angels. It has two alarms and 1 MG nest. The tree platforms provide excellent view for marking enemies however avoid the many zip-lines going in the outpost, as you will be easily seen. If you manage to get on the tree platform located on the east entrance, you can shoot both alarms easily. Keep in mind that due to the Bliss drug in the area, you might suffer from some wobbly hallucinations. The fields provide an excellent place to hide the bodies. In addition, the two Angels in the field must be your last priority. Start with eliminating the enemies located around the main building. Once they are done for, head inside and use silenced weapon to land headshots on four enemies inside. Only then, move to the Angels in the field, once the Angels are down, the outpost will be liberated. If you need to hide when the battle goes sour, you can use the smaller cabins around to hide in. You will be rewarded with money and 400 resistance points from liberating the outpost. There is also a region map and a magazine inside the outpost. Located in the Faith’s region, this outpost is an old abandoned hotel under Cultist use. It is another easy outpost to take over. It has eight enemies including one heavy enemy and two alarms to deactivate. This is overall an easy outpost but if you are not careful and maintain a good approach, things can go sour quickly because of the mostly interior battles with little space to run around for cover. Avoid the main road entrance of the outpost, as you will be easily spotted unless you want to run in all guns blazing. The rocks at the back of the outpost provide an excellent spot for viewing enemies and tagging them. The rocks on the north side provide an excellent view for taking out both the alarms. Once the alarms are down, use the grapple and get access to the roof of the building. From here, you can plan your attack by dropping in from the skylight and crushing an enemy below or you can use silent weapons to take him out from a good distance. For the heavy, track him down and try to get behind him for a melee kill. Once the heavy is down, rest will be an easy job to complete. You can hide in the kitchen and wait for the enemy that keeps patrolling around the area. Once the inside is clear, go out to the courtyard and use silenced headshots on the patrolling enemies and then the ones pouring the Bliss drug. Once all enemies are down, you will liberate the post and earn the vehicle ‘1987 Pygmalion Bruelag as a reward along with some money and 400 resistance points. There is also a region map inside the outpost to collect. Located in Faith’s region, Whistling Beaver Brewery is one of the most difficult outposts to liberate. This is the location where the processed flowers are put through the final phase to become The Bliss. It has three alarms and ten enemies including one flamethrower, one sniper and one VIP. There is also a mortar nest inside the outpost that will be used against you if you are spotted or an alarm is raised. The area is full of explosive barrels and the harder enemies, which are the VIP, sniper, and the flamethrower can easily converge on you if spotted. The location is also tight inside the brewery. For this outpost, we recommend that you do not tamper with the alarms as the enemies can easily spot them and become suspicious. Leave the alarms functional. Tag all enemies and you will know that all enemies except the sniper are on the ground level. If you do not care about the stealth approach and want to take out the alarms, then head to the hills on the southeast side and take out the first alarm, then continue to the north and take out the next one. The warehouse can be accessed easily from different directions including the roof. You can use the ladder located in the northeast side of the outpost. Inside the brewery, you can also find some hiding spaces if the enemies become suspicious. If you are still confused, jump inside the underground duct to hide which is the best hiding spot in the game. For the stealth approach, stick with melee kills as using arrows or snipers can cause enemies to become suspicious due to the close proximity. Use the trash bins to hide bodies and avoid using weapons on the flamethrower and the VIP. Even when enemies become suspicious, reach the upper gantry and snipe all enemies except the flamethrower and the VIP. Once the area is clear of normal enemies, follow them around and strangle them. Eliminating them all will clear the area and liberate the outpost. For liberating them, you will get money and 400 resistance points as a reward. Also, collect the region map from inside the outpost. Lorna’s Truck Stop is located in Faith’s region and it is probably the easiest one in the region. It has two alarms and eight enemies including an animal. It also has two MG nests, which should be not much of a problem if you are planning to go in silent. This location serves as the official fuel depot for the Eden’s Gate and their convoys pass through here making it an important outpost. Avoid the main road entrances, as they will make your trip a small one with the dual MG nests at the front. However, you can use the billboard across the road for good cover against enemy fire. The billboard at the south side of the truck stop provides excellent view inside the outpost and marking the enemies. Set the wolf free for a good distraction and once the enemies are distracted you can make your move. There are also some explosive canisters lying around that you can use for your advantage. If you plan on going in using stealth, the antenna tower is your best option. The roof of the warehouse also has good cover and will let you see the enemies inside the outpost easily. Since there are no heavies or other special enemy types, you will be able to dispatch the enemies easily as long as you do not come in the range of the MG nests if things go sour. Liberating the outpost will give you the Badass outfit as a reward along with some money and 400 resistance points. You will also find a region map inside the outpost. This is another cult outpost located in Faith’s region responsible for processing of The Bliss. There are two alarms and eleven enemies here. The enemies include a sniper, two animals and two angels. For this outpost, your main concern is the sniper, which has an excellent view of the complete area and can spot your kills easily. This makes the liberation harder as you will not be able to do much without taking care of the sniper first. The outpost itself is open and allows a multiple entrance points. Your first priority here must be to take out the sniper. For tagging the enemies, if you crouch between the bliss fields, you will have a good vantage point of the whole outpost. For taking out the sniper, you can approach the outpost from the hills on the east side. Mark the enemies and crawl inside the kitchen once the enemy has been taken care of. Inside, you will have a good view to take out the enemies near the sniper tower. Take them out, crawl to the door and aim at the sniper to take it out. Once the sniper is down, you can easily dispatch the remaining enemies. Once the outpost is liberated, you will earn some money and 400 resistance points as a reward. Do not forget to collect the region map from inside the outpost. Jessop Conservatory is located in Faith’s region and it is used as a research and development lab for The Bliss. It has medium difficulty with two alarms and eleven enemies. One of them is a sniper and one is an animal, which can be used as a distraction. There is also one MG nest in the outpost overlooking the main dirt road leading inside the outpost. Your best approach for this outpost is the mansion house and then heading west, clearing enemies as you advance. The greenhouses give good cover from enemy fire. For tagging enemies, you can use the antennae as it provides the best view of the complete outpost. If you look around the outpost, you can use the woods on the north, the rocks or the water tower as well for marking the enemies. There are plenty of places to hide the bodies in the bliss fields as well as in the greenhouses if you are going for the stealth approach. You can shoot both alarms safely from the southern slope near the small garage. If you can get to the machine gun nest, you can also shoot both alarms from there. The sniper must be your last priority for this outpost as he is in clear sight of many other enemies. If you take him down early, the enemies around him will notice and become suspicious of something happening around them. If you want to remain inside the mansion, you will be easily spotted but if you remain extra vigilant, you can eliminate them quickly. For stealth, we recommend that you start from the antennae, tag all enemies and access the mansion from the zip-line. Eliminate the enemies inside the mansion and then move out. You can also release the caged animal for some chaos moments in the outpost. It will kill some of the enemies, making it easier for you to mop up the rest. Once the outpost is liberated, you will receive money and 400 resistance points as a reward. Collect the region map from inside the outpost. This concludes our Far Cry 5 Cult Outposts Guide. If you want to add anything to this guide, feel free to use the comments section below. Let us know what you think about our Far Cry 5 Cult Outposts Guide and whether or not this helped you out in one way or another.